Washington State coach Ken Bone says the unselfish leadership of point guard T.J. McConnell is a key factor in Arizona's success. TUCSON, Ariz. — Five days removed from Christmas and two days before the New Year and, well, a new Pac-12 season, Arizona coach Sean Miller said words spoken by few coaches in midseason: "I like where we are at." Who’s to argue? 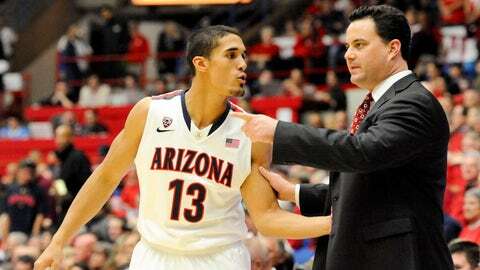 His Arizona Wildcats are undefeated at 13-0, No. 1 in the country and have some of the best young talent in college basketball playing as one. They’ve seen every type of defense, offense and have survived — so far. With everyone returned safely — and on time — from holiday break, last weekend’s practices were two of the best of the season, Miller said. So, it’s no wonder Miller is pretty pleased with his team heading into the Pac-12 Conference opener against Washington State on Thursday. "We’ve talked a lot about what it takes to compete in this conference, and our practices have been sharp," Miller said. "Anything can happen in the next couple of days, (but) we are healthy and our mindset is good going into conference play." Healthy means Arizona 7-foot center Kaleb Tarczewski is back at nearly 100 percent. He’s recovered from the ankle sprain he suffered three weeks, allowing him to go at full speed in practice. It’s not what the rest of the conference would probably want to hear. But the next 10 weeks won’t be a cakewalk for the Wildcats. Arizona hasn’t won a conference regular season championship since 2011. "It’s going to be quite a task," Washington State head coach Ken Bone said of coming to Tucson to get a win. "They are very good in every facet of the game. They’ve got great athletes, they play smart, they play together, and they are very deep." One of the differences Bone said he’s noticed with Arizona this season compared to last season is "they are playing better together as a team." Point guard T.J. McConnell has made them better. That’s been the consensus the last two months. Junior guard Nick Johnson has said it a few times and reiterated it again on Monday. Johnson said McConnell is "the perfect man to facilitate" good chemistry. "He’s unselfish, and that rubs off," Johnson said. "I try to do my best at that also, (setting) a good example." McConnell said he isn’t a "rah-rah" guy, but he tries to lead with hard work. He knows he’s not needed to score points in bunches, so he can concentrate on trying to "make other people happy." He’s done that by averaging 6.4 assists per game. He’s averaging 1.9 turnovers a game. "He’s a vocal leader, more than you realize," Miller said. "His unselfish play is his greatest asset." Miller said the last couple of practices have shown the Wildcats are devoted to improving. "I hope that translates into wins; I hope that it does and will," Miller said. "That will give us a chance to be the best team we can be." It’s quite the change from last season, even if UA was 12-0 to begin the Pac-12 schedule last year. The road to the NCAA tournament became bumpy once the team returned from the holiday break. "We have a different team," Johnson said. "Last year we started to (be full) of ourselves and it started to go south, started to think too much about ourselves. This year we’re staying with our principles being a defensive team and an offensive team with a lot of weapons. We have the perfect team to stay with those principles. We’re not going to let it slip this time." Miller said it starts with having "great people." "I think to a man everyone wants to be part of a winning team," Miller said. "There are some guys who have big numbers and lose and are happy. I don’t think we have that right now. Everybody is tied to each other, and you sense that how they’ve come back this year."